A week ago I was invited for a media event called, Dream Mama by Dream Factory. Dream Factory by Ines Lignon inspires to help the every day person, male, female, young and old to look stylish and good in an effortless manner. As much as we love to, not every woman looks like a yummy mummy everyday. We all have our bad hair days, fat days and "nothing in my closet fit me" days. So, when given the opportunity to speak with an expert like Ines Lignon, I was happy to check out what kind of advise she would provide for us mums. Honestly, in Singapore I feel less of a pressure to dress up and look chic but when we lived in Paris, I honestly would not step out of the house unless I am sure I look good. French women are mostly very well dressed and you definitely do not want to look grubby walking along the streets of Paris. I know that I took better care of myself when we lived there. Even during my pregnancy and right after giving birth, I was very conscious of how I present myself. I made sure I am neatly dressed the moment I stepped out of my bedroom! No pyjamas for me! This is a habit I inculcated in the children now. They would change out of their pjs into presentable clothes before they come out for breakfast. Anyway, back to the event. 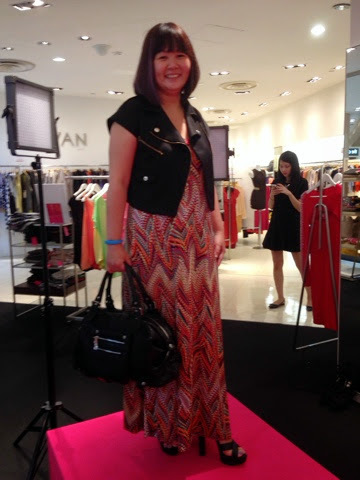 It was held at a pop up at Isetan Scott, level 2. When I arrived, I noticed that the event was filled mostly with Japanese mums. Ines is very popular with the Japanese because of her work with Miss Universe Japan as the National Director between 2003 and 2010. She transformed the Miss Universe Japan pageant from almost obscurity to one of the top beauty events in Japan. This amazing lady has worked with the likes of Sarah Jessica Parker, Liv Tyler and many other celebrities. Yet, she was without airs, was stylishness and at the same time approachable when meeting the average mothers like me. We were all made comfortable during the session, it was almost like a girlie chit chat, with great tips of how to improve our personal style. We started with everyone asking questions. Being the busy mum, I asked her how we can look stylish if we had only 5 mins to get ready in the morning, something I'm sure most mummies can identify with. Her point was to make sure we have clothes in our closet that we know looks good on us that we can rely on for those days. We probably should have a few sets (ready with even accessories) to just throw on without even thinking on days that we feel unattractive. Ines also shared with us her "all in one" lip stick which she could use on the cheeks, on the lips and even on the top lids to brighten up the face quickly. It's a quick way to be a dream mama without taking too much of our time. Lucky me, I was one of the ladies who were given a quick makeover by Ines. On that day, the styling team consisted of herself and two other Miss Universe! Miss Universe Singapore 2011, Valerie Lim and Miss Universe Japan 2009, Hiroko Mima. 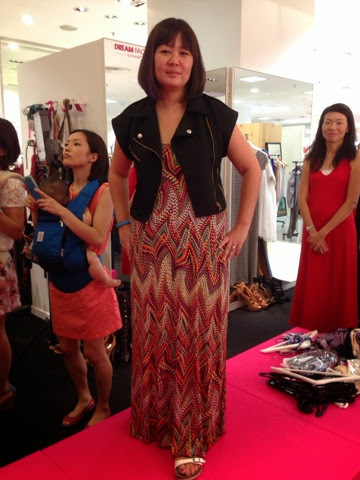 Here's me and my transformed look, a biker chic mum! Ines noticed my purple streaked hair and commented that actually, I am rather funky and could do well with the look. Interestingly, the crop biker jacket is not very much my style but when I looked at the pictures taken, I have to admit that the jacket actually slimmed me down and gave me a nice edge. When I asked if I should carry the bag at the crook of my arm, she said it's actually better to hold in with the hand and low as this lengthens the body rather than making the entire frame broader by carrying it around the shoulders or the crook of the arm. Thank you Dream Factory for the invite. I really enjoyed the session. Ladies who are interested could check out Dream Factory's website for the transformation classes. They also have workshops for younger kids.